Welcome to the Unofficial Hottest 100 database! An unofficial collection of information about Triple J's famous annual Hottest 100 countdown! 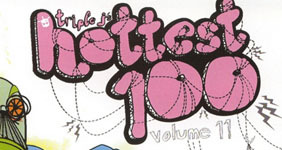 Yearly Countdowns A collection of information for the highly popular Triple J Hottest 100 countdowns for each year. Starting in 1993 until today, these are filled with useful and interesting information. All Time Countdowns A collection of information for each of the original Hottest 100 Of All Time countdowns, and the subsequent All Time countdowns, including the Hottest 100 Australian Albums countdown. Other Countdowns A collection of the other Hottest 100's. Including the #101-200 countdowns that have been released in recent years, as well as Richard Kingsmill's Hottest 100 Of All Time. Triple J is Australia's most prominent youth-orientated radio station and has been broadcasting since 1975, but since 1989, one of the defining aspects of the station has been its annual Hottest 100 music countdown. 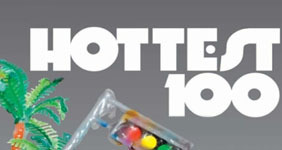 After the station initially began counting down the Hottest 100 songs of all time in 1989 through to 1991, the focus shifted to yearly countdowns in 1993. What followed has led to the Triple J Hottest 100 becoming the biggest musical democracy in the world. 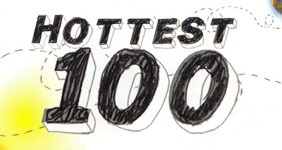 To gain a valuable insight into how the Hottest 100 began and who was responsible, click below. The Triple J Hottest 100 is one of the most accurate example of listener's opinions of alternative music. It has become the largest music poll in the world and, as such, has spawned countless facts and figures associated with the songs that have been voted in. The statistics section gives insights into how artists have performed over the years, cover songs reaching the countdown, the available voting lists for previous years, and, possibly the most intensely researched area of the site, the release dates of each song. To gain a valuable insight into the Hottest 100 and for all the facts and figures associated with each year, click below. CD Releases A collection of information for the CD compilations for each of the Hottest 100 countdowns. From 1993 to present. Cassette Releases A collection of information for the cassette compilations that accompanied the CD releases from 1993 until 1998. DVD Releases A collection of information for the DVD compilations that accompanied the CD releases 2002 until 2013. I've been a fan of Triple J for a long time, and as any listener would know, one of the defining aspects of the station is the annual Hottest 100 countdown. After years of helping to maintain Wikipedia articles and adding information to them, I became annoyed at the lack of interesting, allowable information available on those articles, and the accessibility of past, albeit very good, information from the Triple J website. So in early 2012, the original version of this site was launched. A year later, and after a massive redesign, and a shift to a far more reliable web server, the new unofficial Hottest 100 database was launched in January 2013. So, this site intends to collect as much data relating to the Triple J Hottest 100 as possible. To get started, simply click on any of the links at the top of the page, and enjoy as much as possible.